I love fruit in my stuffing. Whether it’s cranberries, apples or dried cherries, I love how the sweetness from the fruit brings out savory and salty flavors in the stuffing. Paired with the earthy and hearty texture of mushrooms, it’s a popular combination well beyond the Thanksgiving table. I also like to add a little extra broth to my stuffing because I like to keep it moist – and I also like to leave it in the oven about 10 minutes longer than normal to achieve a crispy top. Every family does stuffing a little differently, but once you consider adding mushrooms, you’ll have a hard time saving it for the big day. If you’ve got vegetarian guests, or are a vegetarian yourself, this stuffing is for you. All the delicious meatless flavors of Thanksgiving, packed into one baking dish. Enjoy! Add the olive oil to a large skillet and then sauté the sliced mushrooms and chopped onion with the Marsala cooking wine. Let sauté for about 6-8 minutes, or until mushrooms have browned and onions turned opaque. 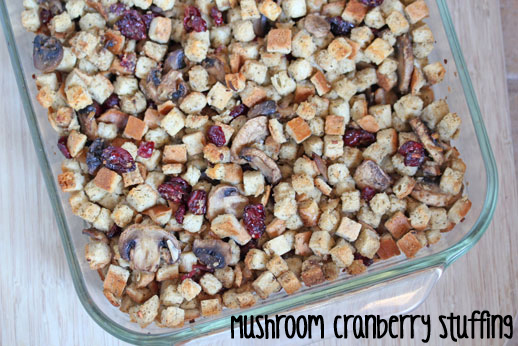 In a large mixing bowl, toss together the herb cubed stuffing mix, dried cranberries, celery salt, sage and pepper. Once the mushrooms have sautéed, add them to the stuffing mix and toss well. Stir the vegetable broth into the stuffing mix and gently turn into a 9×13-inch glass baking dish. Bake in the preheated oven for 30 minutes. Or add an additional 10 minutes to your baking time if you want a crispy top. Serve warm as side dish with roasted turkey.